The first time I saw this LP, it was in the hands of a stranger who had just purchased it at a garage sale. I saw the title and was shocked - couldn't believe such an album existed and I was jealous I hadn't found it first. 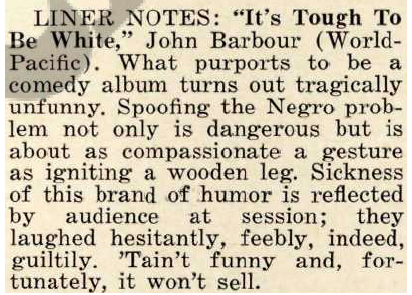 A couple years later I found my own copy and it became immediately obvious that it was a satirical comedy album, the title in vain. Part of me was relieved and another part of me was disappointed. World Pacific Records did not specialize in comedy. Alternately known as World Pacific and Pacific Jazz, the label cranked out great jazz LPs by the likes of The Jazz Crusaders, Les McCann, Gerry Mulligan and many more. They pressed under the World guise The Endless Summer soundtrack, plenty of Ravi Shankar stuff and a couple comedy albums. Like their West Coast jazz rival Fantasy Records, they had a penchant for pressing things on lovely translucent red vinyl. 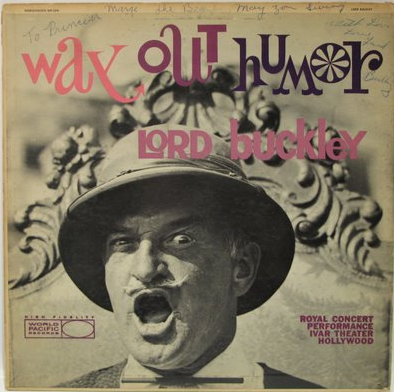 Whereas Fantasy Records released comedy by hipster hero Lenny Bruce, World Pacific pressed five comedy albums by hipster hero, and Bruce's occasional rival, Lord Buckley. 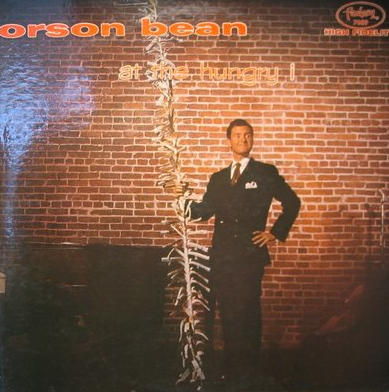 Fantasy put out a rare non-Lenny Bruce comedy album, Orson Bean at the Hungry I. 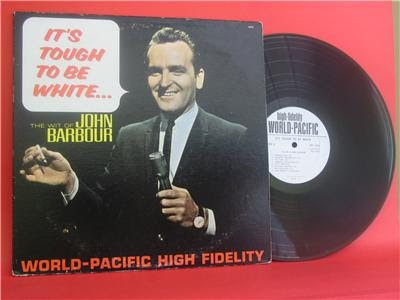 Likewise, one of World Pacific's only non-Lord Buckley comedy albums is today's showcase - It's Tough To Be White... 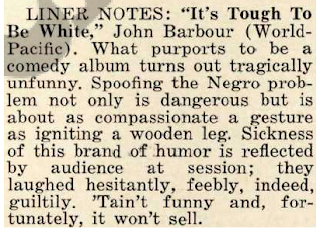 The Wit of John Barbour. I like you. 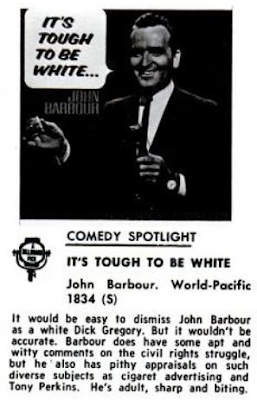 I think you're one of the brightest, sharpest young comics around. I would like to say your album is dynamite, but I wouldn't want folks in Alabama to pick it up just to throw into churches! You think you got it tough! You were born in Canada. I'm from Chicago. If things get too tough for you, you can always go farther north. Me - I can't go in either direction. Your stuff touches the nerve ends, but it is funny. It could be a smash best seller, which makes me happy, 'cause if folks are inside laughing their heads off, they can't be outside blowing ours off! I love this song - it enjoys heavy rotation on me turntable.